Wow Pot is a very colorful game, with a classic inspiration which is unmistakable, but also with a progressive jackpot offered inside which makes it a lot more attractive than it would normally be. It has some good features as well, but those are used in plenty of other classic titles these days that they don’t make a difference anymore. The developer which offers this game is Microgaming, owners of a big collection of classic titles. 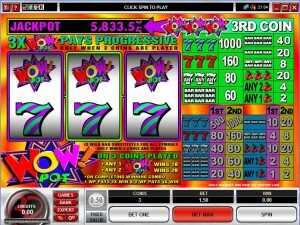 It has 3 reels, with 1 payline and a progressive jackpot as the best prize you can get from it. You also have access to wilds with multipliers, provided that you used enough coins in your bets. The game’s main feature would be its wild symbol, also capable of applying multipliers to wins it contributes to. First of all, the image representing the wild symbol is the one with the Wow Pot Logo on it. Triggering the wild symbol or the progressive jackpot requires that you use three coins. If you use one or two coins, the features of Wow Pot will not be activated, so you have only regular symbols and it’s a very simple classic in that case. With three coins, you get a chance at the progressive jackpot and the wilds are also active. The unfortunate part is that the third coin does only that, without increasing the value of the prizes awarded by the rest of the symbols. The wild’s presence on all three positions of the line will give you the progressive jackpot, with the bet requirement being that you used 3 coins that round. The wild is also the usual feature which substitutes for other symbols, also applying a 2x multiplier for each one that is part of a combo. With two of them in a combo, and a third symbol being a regular one, the multiplier will go to 4x. You have a wager which goes from $0.50 to $1.50, depending on how many coins you want to use. 1 to 3 coins are wagered on a single line, the denomination being fixed at $0.50. The best reward, with a 3 coin wager, will be a progressive jackpot which has been won at values of up to $51,000, but the average has been at $15,000. You’re not going to be impressed with the design the game has for you, but it works well enough for it. It doesn’t seem to have a specific theme, with all the regular symbols being classic icons, while the wild shows the game logo. You have the paytable on the entire right side of the screen, with the reels, the progressive jackpot and the wild being on the left. A fire like abstract picture is visible behind the game area. Symbols: Wow Pot Logo (progressive jackpot, wild), Green & Purple 7 (1,000 coins), Red 7 (160 coins), Any 7 (80 coins), Three Bars (60 coins), Two Bars (40 coins), One Bar (20 coins) and Cherries (20 coins). The progressive jackpot is the one that makes it worth pursuing, but you will have to decide if you prefer the classic or the 5 reel version of the game, they both have the same wager and top prize. This Wow Pot 3-Reel slot is offered by all online casinos with Microgaming software, playable either in practice or in real money mode.